Caring for your child’s teeth is critical to safeguarding their health and encouraging good habits. 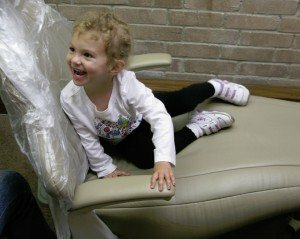 Here are some tips to navigate the waters of pediatric oral hygiene! Don’t wait to start cleaning your child’s mouth. Keeping your baby’s mouth clean must start before teeth even appear – a clean, moist gauze pad or washcloth does wonders for the gums. This starts the cycle of your child knowing Mommy or Daddy is going to clean their teeth. As soon as that first tooth pokes through, begin twice daily (at least!) brushing. Toothpaste – until age 3, use a smear of fluoride toothpaste no larger than a grain of rice. Then from about 3 to 6 only increase to the size of the toothpaste to the size of a pea. If your child does not effectively spit, have them tilt their mouth down so the toothpaste dribbles out into a cup or the sink to limit consumption. Soft bristled toothbrush – you want something very soft and age appropriate – children’s brushes are sold with recommended age ranges listed, so they should be easy to spot. However, the parent MUST still watch the child brush teeth. Kids are notorious for not brushing well or long enough. If you have to, parents can go back and brush. To really increase your child’s odds of not having a cavity invest in a kids electric sonicare toothbrush. Floss – you should begin flossing for your little one as soon as they have two teeth that touch. Continue flossing daily and going over techniques with them until they are competent with the floss and can handle going it alone. This sets your child up for successes in life if they grow up always flossing their teeth. Watch out for sugar. Teeth and sugar just don’t get along, and baby teeth are no different. The bacteria in your mouth eat the sugar and poop acid that destroys teeth. Clean your child’s mouth after every meal, limit sugary drinks during the day and after brushing at night. No milk at bedtime after teeth have been brushed and do not dip pacifiers in anything sweet. Get that baby to our office! It should happen sooner than you might think – we recommend that the first visit occur by the age of two years old, for sure no later than three. 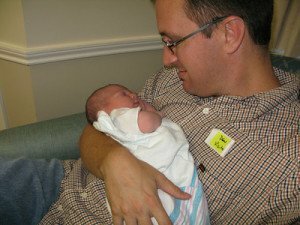 That first visit is really more of a meet and greet – designed to make your child feel comfortable and pave the road for successful future visits. 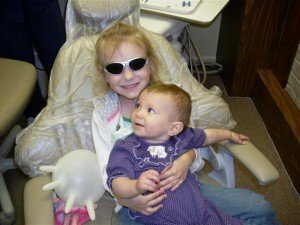 At this appointment Dr. Nugent will go over more advanced dental health tip and tricks to set your child of up for successes. They can sit in the “big chair” with mom or dad and meet Dr. Nugent. As your child grows your provider will do more and more until they are getting a complete and advanced dental cleaning every 6 months. Dr. Michael Nugent is a Pasadena, Texas Dentist that is located at 3421 Burke Rd Ste A, Pasadena, Texas 77504. He is a father of two awesome daughters and does his kid’s dentistry. 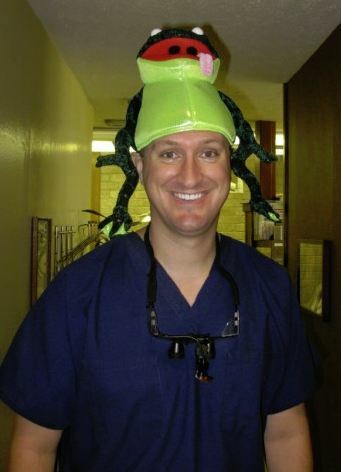 Dr. Nugent is silly and makes kids feel at ease in his dental office.